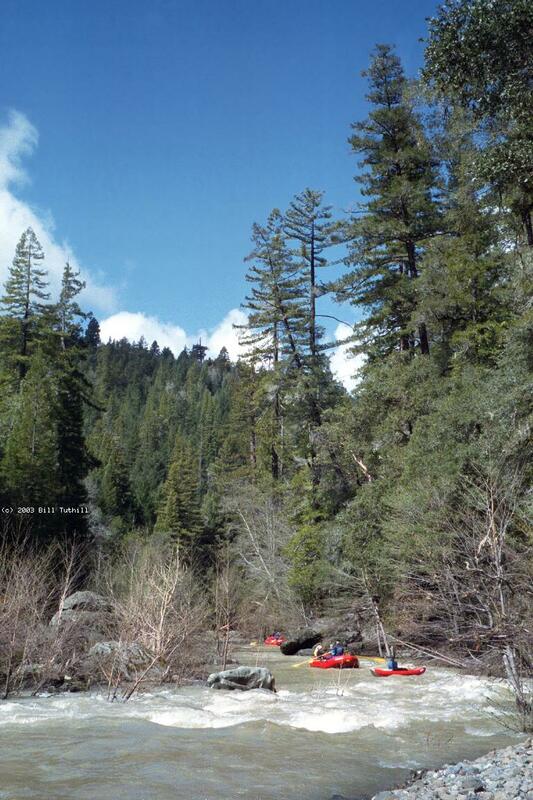 With a sprinkling of fun rapids and good scenery (mossy banks and second growth redwood forest), this is one of the best class II wilderness runs in California. In recent years the water seems less muddy after rainstorms, perhaps because upstream sheep grazing has been reduced. The Ham Creek picture below shows how muddy it used to be. By the time the water turns pure green, this creek is no longer high enough to run in a day. That's not so bad, because there are plenty of great camp spots, although you need a map to know which are on public land. Please be careful at high flows: Rancheria Creek has already claimed one victim. In years with heavy rainstorms, logjams and occasionally landslides occur. These can present a major hazard, especially because boating season coincides with storm season. You might be the first party to run Rancheria Creek since the logjam or landslide occurred. Brush update 2014: The worst spots for brush are a quarter mile below put-in, just above Mike's Rapid at mile 4.3, and in the approach to Landslide Rapid at mile 8.5. Take-out has also been obscured by growth of willows: don't miss it! Put in on the far (southwest) side of Mountain View Road bridge, where a special access ladder was added onto the bridge in late 1999. You might need to lower your boats down on a rope. At high flows there is no beach, but bridge concrete offers traction. The former put-in just upstream, now fenced off, was also river left, and involved a trail down to a sidecreek. Horse Creek, clearer than the main creek, enters on the left. Be on the lookout for down logs, always a hazard after recent rains. 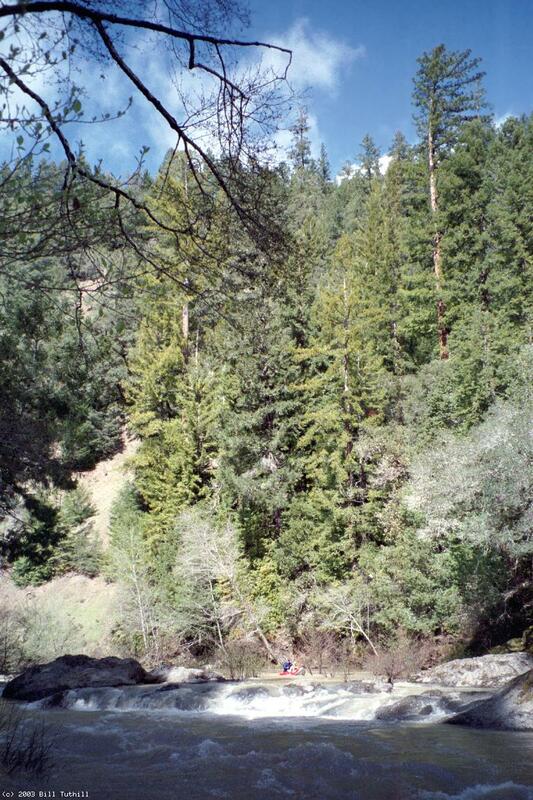 Cold Springs Creek, remarkably clear, enters on the left, and mixes slowly with Rancheria Creek's silty water. 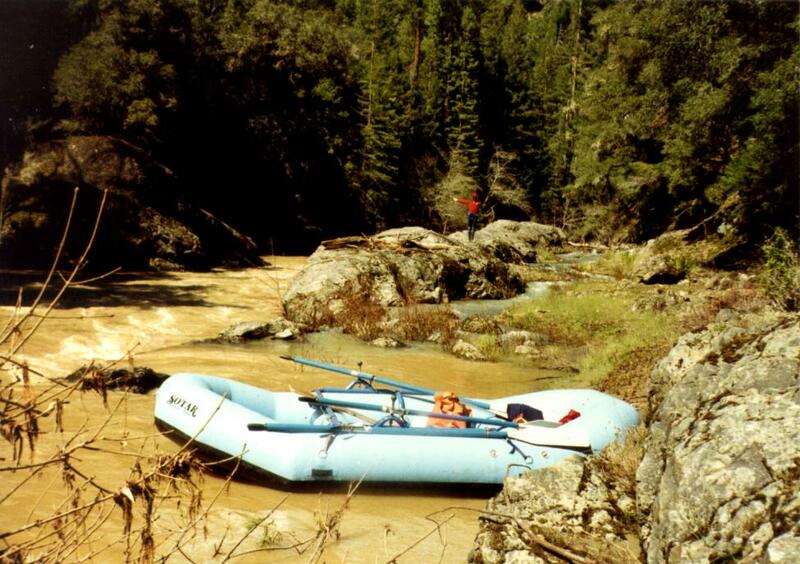 Mike's Rapid, class II+, announces the beginning of a fun section of relatively continuous rapids in (not really so) Big Canyon. 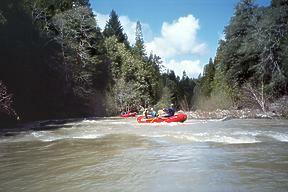 In a relatively open section, a partially submerged willow island hides a large rock (hole at high flows) in the right channel, with swiftwater below. The left side of the island is runnable only at flows above 3000 cfs (as measured below take-out at NRN). After a series of dry years, the willow bar on the right plugs up and forces most of the water over top of a bedrock formation, creating a class III rapid. After floods, the willow bar gets rinsed clean, creating a class II bypass on river right. A landslide in 1997 created a rapid that has gradually eroded from marginally unrunnable, to class III (1999), to class II (2003). The creek enters another class II canyon. Ham Creek enters on the right, its clear water spilling into a rock rib. Good view into the mouth of its canyon. Anderson Creek, draining the Boonville area, enters on the right. 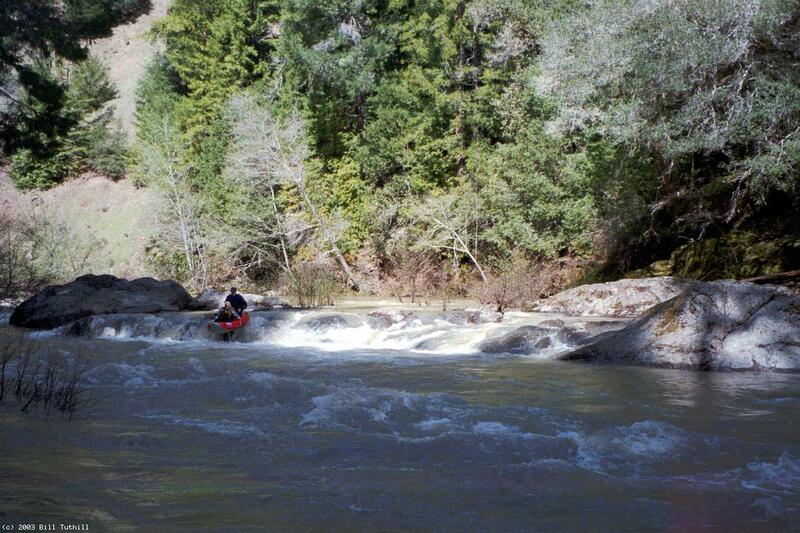 Gradient diminishes; slow current and approaching twilight often make paddling the remaining section a chore. 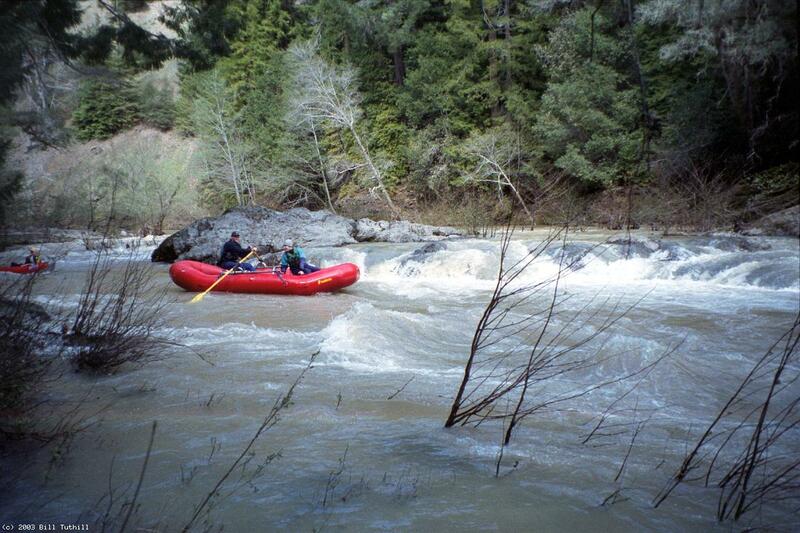 Indian Creek enters on the right, creating the Navarro River, although usually not adding significantly to the flow. New high-bridge at Ray's Road, a possible take-out, although legal status is unknown. To reach this bridge, turn south onto Ray's Road in Philo. Outside of town, take the left fork twice. Parking lot on the left bank makes a good take-out, although you'll have to pay the entrance fee for Hendy Woods State Park. 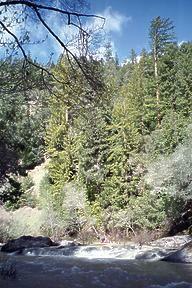 If any daylight remains, you might want to visit the ancient redwood grove just upstream of the parking lot. Greenwood Road bridge, a free but rather unpleasant take-out. To reach take-out, drive west from highway 101 just north of Cloverdale, uphill and downhill about 27 miles to the town of Boonville, where good hotels and restaurants are available. Continue north four miles beyond the town of Philo, and turn left onto Greenwood Road, which leads to a bridge over the Navarro River, and to Hendy Woods State Park just beyond. 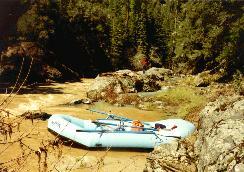 Camping is available in the state park, and is seldom or never crowded during boating season. To find the take-out parking lot, drive as far as possible into the park. 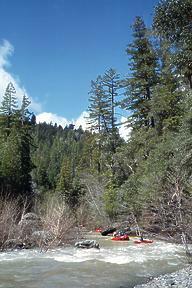 Due to a line of willows that has grown up along the riverbed, blocking your view, scout take-out before shuttling. To reach put-in, return to Boonville and turn right onto Mountain View Road, which passes the airport, climbs a hill, and then descends to Rancheria Creek canyon. Parking is tight and can be crowded near the bridge. Do not leave valuables in your vehicle.